You’ve had an unparalleled rise to the top of the sport. 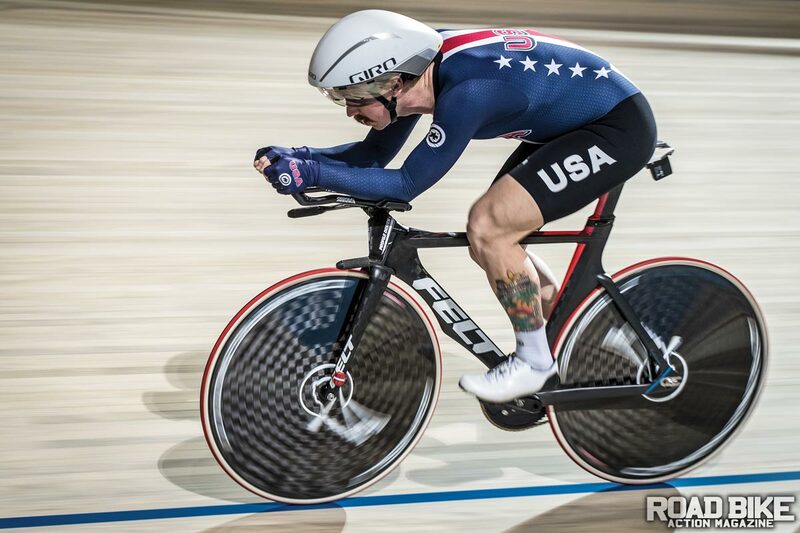 Can you describe your path to the 4k individual pursuit world record? It’s been a crazy path! I started doing normal road racing in Nebraska. It just wasn’t for me at the time, and I got pretty burnt out on Midwest crits. I delved into ultra-distance with some randonneuring in college for a while, then I moved to Kansas. The gravel was a natural progression after the move, since there was so much of it and easily accessible! We also have an amazing community around a grass track in Kansas, which is where I started track racing in 2017. After that, I set my sights on racing national championships. I started up the USAC ranks, went to town in Pennsylvania, won national championships in 2017 and got started with Team USA. It’s crazy now, but the progressions at the time all made sense! What have been some of the unexpected outcomes of your quick rise? After winning my first national championship, the path to the national team and World Cups was definitely unexpected. I didn’t know there was a men’s track endurance program in the works, and I certainly didn’t think I was good enough to join up that quickly. Traveling the world with amazing teammates has been the best part of this whole journey. Your background in ultra-distance events is a unique path to success on the track. What did your path to success look like? I’m not sure if I gave the ultra-distance aspect much thought when I started out. I’ve always set my goal on the highest level and decided to make that happen. When I first got into cycling by spying my dad’s road bike, I thought a century ride was the way to go, so I rode my first century when I was 15. I was hooked after that and I still love a good, long day on the bike. Usually about a couple of Erg-mode sessions, some long rides, followed by time in the gym. I have a pretty active lifestyle outside of training, but I just count all that as cross-training. Picking up big pieces of wood all day can’t make you slower, right? What do you do off the bike (e.g., nutrition, training, mentality, lifestyle) that gives you an advantage on the bike. I think my lifestyle is a good balance between training, life and rest. I get a hard time on the team for always walking to places when we travel, but I can only watch “The Office” so many times on a trip! For example, when I’m at home I’ll bust out a two- to three-hour ride, eat, and go out and cut wood for three to four hours. We live on a small farm, so there are always things to do. I feel better being moderately active when I’m not training. I’ll take a spa day every couple of weeks and get a massage, some chiro, and a sensory-deprivation float all in one day. Even the hard work is mentally restful as long as you enjoy it! What is your goal for the upcoming Track World Championships? Anymore world records? A top five for the Team Pursuit would be amazing at Worlds. As far as the Individual Pursuit is concerned, we’ll have to see! It depends on the schedule, getting the men’s Team Pursuit to a good result is the top priority. Poland is a great track, so I’m hoping for some good times in both events! Do you see yourself competing in the Olympics even though Individual Pursuit isn’t offered? I try to visualize that every day! Even though Individual Pursuit isn’t an option, Team Pursuit is my main focus, as well as the focus of the program. It’s been my goal to compete in the Olympics since I started cycling, and I certainly hope to be a part of the program that makes it to Tokyo! I’d like to promote rabbits as pets. You can usually check out ours on my Instagram, and they are even cuter in real life. They don’t chew up your shoes or bite the mailman. If you are thinking about getting a pet, ask me about our rabbits! More seriously, I wouldn’t be able to do any of this without the support from my family and the family business, Creative Landscaping. They’ve been so supportive of this endeavor from the grass track until now, and it’s been awesome. All the sponsors that help me—Speedvagen Racing Machines, Jakroo Clothing, Bont Cycling, Movement Chiropractic, Lost in Float and Athletic Strength Institute—and all of the sponsors who help out USA Cycling!